Run various algorithms to optimize the IR. Translate the final IR to machine code. 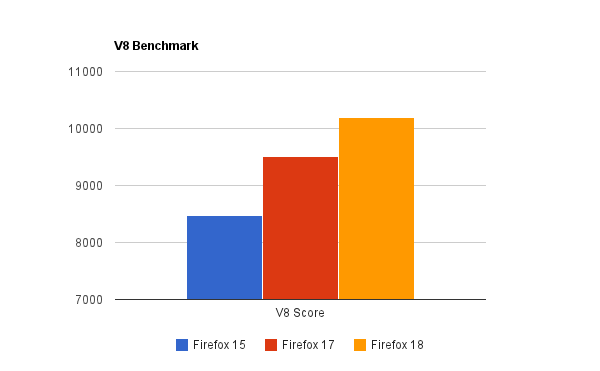 On Google’s V8 benchmark, Firefox 15 gets a score of 8474, and Firefox 17 gets a score of 9511. Firefox 18, however, gets a score of 10188, making it 7% faster than Firefox 17, and 20% faster than Firefox 15. We still have a long way to go: over the next few months, now with our fancy new architecture in place, we’ll continue to hammer on major benchmarks and real-world applications. For us, one of the coolest aspects of IonMonkey is that it was a highly-coordinated team effort. Around June of 2011, we created a somewhat detailed project plan and estimated it would take about a year. We started off with four interns – Andrew Drake, Ryan Pearl, Andy Scheff, and Hannes Verschore – each implementing critical components of the IonMonkey infrastructure, all pieces that still exist in the final codebase. It’s really rewarding when everyone has the same goals, working together to make the project a success. I’m truly thankful to everyone who has played a part. Loop-Invariant Code Motion (LICM), or moving instructions outside of loops when possible. Sparse Global Value Numbering (GVN), a powerful form of redundant code elimination. Linear Scan Register Allocation (LSRA), the register allocation scheme used in the HotSpot JVM (and until recently, LLVM). Dead Code Elimination (DCE), removing unused instructions. Of particular note, I’d like to mention that IonMonkey works on all of our Tier-1 platforms right off the bat. The compiler architecture is abstracted to require minimal replication of code generation across different CPUs. That means the vast majority of the compiler is shared between x86, x86-64, and ARM (the CPU used on most phones and tablets). For the most part, only the core assembler interface must be different. Since all CPUs have different instruction sets – ARM being totally different than x86 – we’re particularly proud of this achievement. IonMonkey is enabled by default for desktop Firefox 18, which is currently Firefox Nightly. It will be enabled soon for mobile Firefox as well. Firefox 18 becomes Aurora on Oct 8th, and Beta on November 20th. * Note: TraceMonkey did have an intermediate layer. It was unfortunately very limited. Optimizations had to be performed immediately and the data structure couldn’t handle after-the-fact optimizations. Awesome! How’s this compare to Chrome’s offerings? You are quite correct! SpiderMonkey’s GC team is working hard on a new scavenging collector which should get us the rest of the way there. Have you tested memory usage with new JIT compared to the old one? Last I measured in the shell, it was roughly in the same ballpark as JM. Before the release we’ll make sure to hook up the about:memory reporters (bug 747202). Thanks, that completely slipped my mind! Chrome x86 Version 23.0.1262.0’s V8 Benchmark Suite – version 7 score is 12381. I’m running Windows 8 Pro x64 with 4GB RAM. I’d love to see Firefox 18 final release soon. That would be cool – we’d have to see how often it affects high-level code. A lot of what GVN eliminates is just stuff generated by the compiler itself. JS operations break down into smaller components, and these end up being redundant from statement to statement. Congratulations for a year of great work! How do you determine what a “long-running” application is? If a function/loop runs enough times (I think right now it’s 10,000), the higher-powered compiler pays off. That’s not really a good definition of “long-running application”, it’s more like, “something that will benefit from the compiler”. Is there a way to see what optimizations has been made to the code after the fact? Question, is that project plan available publicly? I’d like to see a sample plan for a project like this. I think all but “Baseline Compiler” and “Debugging” ended up being accurate by the end. Great stuff – but why is this blog not syndicated on p.m.o? 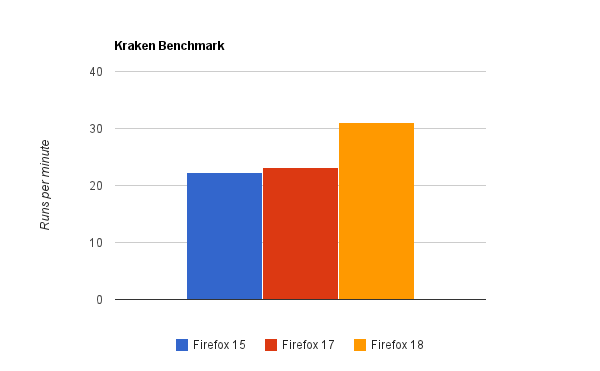 seems you were so excited about ‘this’ announcement that you forgot to benchmark firefox nightly with ‘the ionmokey engine’ this announcement was about. IonMonkey noticeably regressed SunSpider. Don you care about SunSpider anymore? Yeah, we took a 3-5% SunSpider regression. We intend to fix this before Firefox 18 ships. IonMonkey is the heavy duty compiler intended for long-running code. SunSpider tests often run in 0-3ms, so compilation time, and choosing which compiler to use, can be a huge factor. It’s also visible on AWFY that regression is bigger on older machine. why isn’t this blog on planet.mozilla.org? I’ve tried the latest firefox 18 beta. On my mac, it scores 10,932 in v8 benchmark where as Chrome scores 14,000. For firefox 17, it scores 9885. Drilling down into each individual tests, I found that there are significant improvements in certain tests like Raytrace, DeltaBlue. But there are also noticeable degradations in the test Crypto, hence cancelling out some of the gains in score. I suppose the drop is due to the extra time in optimisation. RegExp remains very poor compared with Chrome. Another observation is that the performance is noticeably affected when the benchmark is run again immediately. The memory skyrocketed to about 1G. The GC is definitely one area to look into. I’m looking forward to see how IM deals with complex JS libraries, like ExtJS. Really, I like the Firefox 18 version, great changes in Web Developer tools but We want something like Chrome Development , which is more easier to use and the Speed of this current version is good but I think not as compare to Chrome Still. Any Way Great job, I am waiting for another version to see good changes. Did some prime number calculations (including some bigint work-around) I found that Firefox is, unfortunately, still at least 3-4 times slow than Chrome. But it’s getting better. Are we going to see some more speed improvements? Benchmark scores are simply wasted time. Please, use Firefox 18 one day with some web apps, for example Tine 2.0 or something similar. It’s no fun, because it’s slow. If you are using Chrome instead, these web apps reacting much faster. Not as fast as a native OS application like Kontact etc., but much faster than Firefox. And yes: I already tried a clean installation without my installed extensions. There ist virtually no difference between zero installed extensions, 5 installed extensions or 35 installed extensions. It’s sad because I love Firefox for years for it’s extensions, but the performance didn’t get much better. It’s getting harder to work with Firefox. My application is facing issues when the new IONMonkey JIT is enabled. But works perfectly fine otherwise. Can someone guide me to the right forum to post this issue and get it resolved? cool.that ‘s why we like firefox. SpiderMonkey heaps are each restricted to use on a single thread. You can have multiple heaps, but they have to be on different threads. Now, there are some flourishes on that basic description of things. For example, we’re experimenting with “parallel” JS which can in some circumstances perform an apparently-parallel operation across a bunch of threads, falling back to a single-threaded implementation if any thread tries to do something that can’t be parallelized. And we have APIs which allow one runtime to send a value by “structured clone” to another runtime, which lets you do some sorts of message-passing (ideally with small messages). And there are other ideas being researched, which might make their way into JS the language if they pan out well enough in SpiderMonkey (and the other way around).